Member" of the Program and will receive Points for each purchase moving forward. 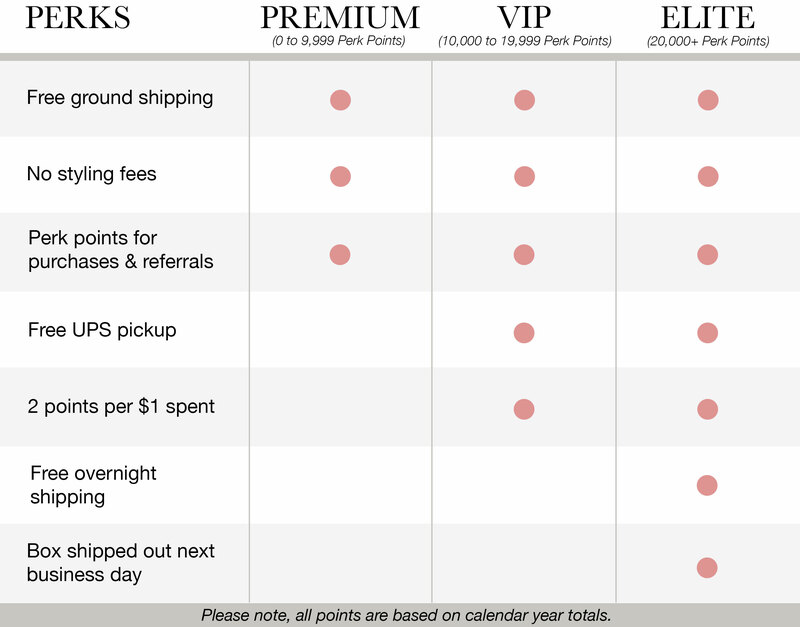 Perks Program level ("level") refers to the status based off cumulative Points within a calendar year. Perk Points ("Points") refers to Member point balance and Perk Credits ("Credits") refers to dollars of discount a Member receives. Members participating in the Program, agree to be bound by these Terms and Conditions (“Member Terms and Conditions”), as they may change at any time. In these Member Terms and Conditions, the phrase “Net Purchases” means subtotals of purchases less returns and any applicable sales tax; “we”, “our” and “us” mean Front Door Fashion; and “you” and “your” mean each Member enrolled as a Member of the Program’s General Terms & Conditions. We reserve the right to change these Member Terms and Conditions or the Program at any time and in any way (including our right to discontinue or change the benefits, change the expiration date of perk Points or Perk Credits received under the Program, merge the Program with another Program at a later date, or adjust the number of Perks Points received for each dollar in Net Purchases,) as we explain further below. Updated versions of these terms will never apply retroactively and the updated terms will give the exact date they go into effect. If we discontinue this Program or merge this Program into another Perks Program, it is possible you may not be able to receive perks Points to redeem a credit or increase to a higher level. To the extent required by applicable law, we will give you notice if we end the Program or make a major change to it. Your continued participation in the Program after we make changes to it or these Member Terms and Conditions signifies your acceptance of such changes. We reserve the right to cancel your participation in the Program in the event of fraud, abuse of privileges, or violation of these Member Terms and Conditions. You are responsible for any tax liability related to your participation in the Program. The Program is available to any resident of the Continental United States. Front Door Fashion employees are not eligible to participate in the Program. Corporations, groups and associations are not eligible to participate in this Program. At the end of the calendar year, only the balance remaining to hit the next Perk Credit will carry over. If a Member was 1,000 Points away from gaining a $20 Perk Credit, then only 1,000 Points would carry over into the next Program year, regardless of their Perk Program level. All other Points will be erased at the end of the current Program year. Any Perk Credit remaining at the end of the calendar year will carry over for a Member to use on their next purchase. Once a Member reaches a VIP or an Elite level, they will remain in the that level for the current Program year. Member Status will rollover for six (6) months into the following Program year, however same point expiration rules apply. Member will have six (6) months to maintain and reach Point requirements to stay in their current level. If a Member doesn’t maintain the level within the six (6) months, they will move to the level in which their current point balance falls. All Points will be forfeited if Member’s account is closed or deemed not in good standing by FDF. Members have the option to refer friends using a unique referral link provided at the time of joining the Program. Referral link can be found by logging into your account at FrontDoorFashion.com. In order to earn referral Perk Points, each referral MUST sign up and order from Member’s unique link. No Points will be awarded otherwise, and no exceptions will be made. Referral’s order must be their first order with Front Door Fashion, and the order must be generated from your unique referral link. Referral must make at least one purchase for Member to receive Points, and Points will not be earned until Referral’s order is completed with payment. Referral links are applicable only to box orders and Style Sessions. Members have the option to earn bonus Points when an order qualifies at the noted spend levels, or during bonus Point periods. Order bonus Points above are earned when Member’s Net Purchase is above qualifying spend levels. 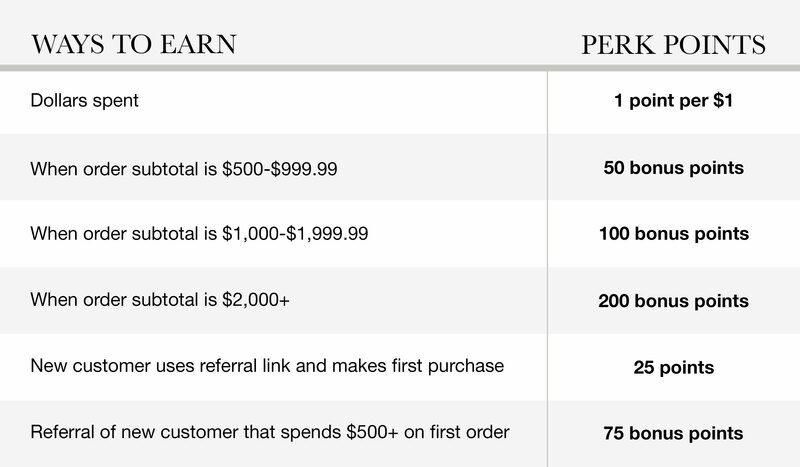 Order bonus Points are earned per individual order, and Net Purchase pertains to a single order. Member must hit spend level on individual order to receive order bonus Points. Promotional point periods will be available sporadically during the Program. Member must adhere by promotional point terms and conditions noted during promotional periods, as they are subject to change. For every 2000 Points that you earn, you will receive a $20 Perk Credit applied on the next order which does not already include a discount of any other type. Credits cannot be redeemed on current or past purchases. Credit redemption cannot be combined with any other discount. If any other discount is applied to the order, Perk Credit is not redeemed. Perk Credits are nontransferable. Credits you receive but do not use will expire one year from date of issuance unless otherwise indicated on the issued Credit. Members have the opportunity to gain access to Perk level once earned Points are equal or more than Status level required Points. All levels will receive free ground shipping, no styling fees and applicable bonus and referral Points as noted above. VIP level Members will receive, in addition to entry level benefits, the option to choose free FedEx pickup for all future orders and double Points on each purchase, once gaining access to VIP level. Elite level Members will receive, in additional to entry and VIP level benefits, priority box benefits including the option for orders shipped out the next day with free overnight shipping. Once a Member reaches the level of qualified Points to move to the next level, a notice will be sent to the Member directly and will include explanation of benefits in the new level. Please note, all points are based on calendar year totals. For all returns, original Points awarded will be recalculated as if revised order after return were the original order. If original order was placed during promotional point period, promotional point calculation will be used to reduce Points, and any new Points awarded will be based off current order and promotion. All exchanges results Points being recalculated as return order and new order with same rule above. When a return is made where $20 Perk Credit has already been redeemed from another order, 2000 Points ($20 equivalent) will be deducted from Perk point amount (even if that makes the Perk Points a negative amount) to compensate for the $20 that has been awarded to the customer. Governing Law and Venue. These Member Terms and Conditions will be construed and interpreted under the laws of the state of Texas, without regard to any Texas conflict of law provisions. Any action or proceeding relating to a claim or controversy at law or equity that arises out of or relates to the Member Terms and Conditions (a “claim”) must be brought in a federal or state court located in Dallas, Texas. If any part of these Member Terms and Conditions is found to be void or unenforceable under applicable law, all other parts of the terms and conditions will still apply. All dollar amounts referred to in these Member Terms and Conditions are in U.S. dollars. Contact Company First. If a dispute arises between you and Front Door Fashion, our goal is to learn about and address your concerns, and, if we are unable to do so to your satisfaction, to provide you with a neutral and cost effective means of resolving the dispute quickly. You agree that you will notify us about any dispute you have with us regarding the Member Terms and Conditions by emailing knock@frontdoorfashion.com.